Wellington: The Indian women team lost their first T20 match against New Zealand by 23 runs here on Wednesday. 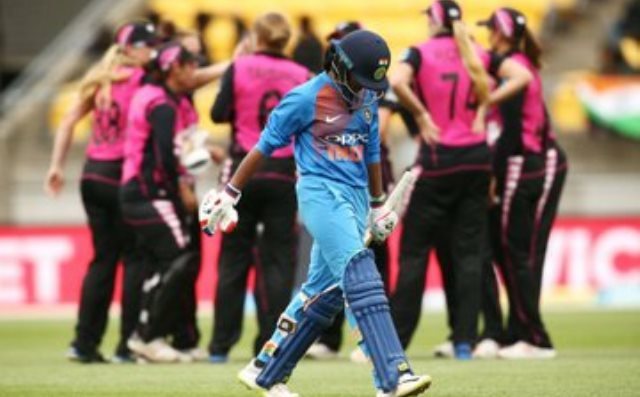 The hosts posted a total of 159 with the loss of 4 wickets when they were put into bat by India’s t20 captain Harmanpreet Kaur. The pick of the player in the New Zealand innings was the opener Sophie Devine who scored 62 runs off 48 deliveries which comprised of six boundaries and two sixes. India failed to chase down the victory target despite power hitting from Smriti Mandhana scoring 50 off 24 deliveries. For New Zealand, Lea Tahuhu was the highest wicket taker by scalping 3 wickets. Leg spinner Leigh Kasperek took the crucial wickets of Smriti Mandhana and the Indian captain Harmanpreet Kaur in the match. However, the Indian innings was eventually unfolded at 139 with five balls to spare. The Indian team will now look to bounce back in the next match, scheduled to be played on 8th Feb.